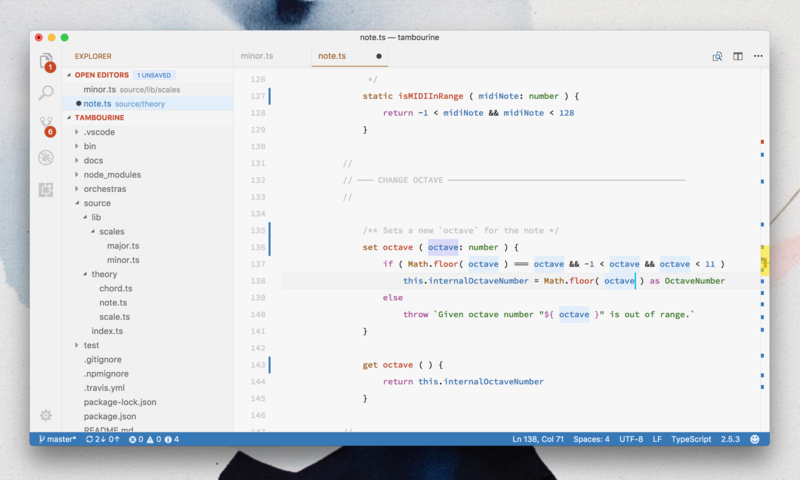 Visual Studio Code>Themes>Kary Pro ColorsNew to Visual Studio Code? Get it now. The famous, carefully harmonized themes loved by thousands. Given the possibilities and limitations we have tired our best to fully recolor Visual Studio Code to a new level and make it an entirely new experience which we really hope you like and enjoy! This theme includes two minimalistic icon packs that are carefully choosen for the style and coloring of this theme. The icons in these sets are designed by AnhGreen and Kiranshastry. This theme works great on many file formats but it works even better on some very special formats because we provide first class support which means each token of these languages are specifically themed and they will look sublime when you work with them in this theme. Good font to use with this theme? To use it best, we suggest you use the medium weight of Hasklig typeface. It's a fork of Adobe Source Code Pro with programmer ligatures. Our theme is the best match to this typeface. These awesome guys who made the high quality icons and shared them for free. Thanks to these very awesome people for reporting problems, suggesting ideas and helping us bring new languages to the theme. And thanks to these guys at Visual Studio Code's team for always being there when we had a problem and needed hot fixes and or when we asked questions and they answered kindly! New! — Breadcrump color support added. New! — Active line color support added. New! — A new icon :D.
New! — CSS Vendor specific properties are now supported. New! — CSS Keyframe rules are now colored. New! — Sidebar Git Diff properties are now supported. Change! — What is better than a great new name? After the transition of the themes they were renamed and well let's agree that the name wasn't good right? It's now calld "Pro Colors" do you like it? New! — GLSL Language is now fully supported! Fix! — More and more CSS tokens are supported! Fix! — Much better C++! Change! — A much improved Terminal look. Change! — Dropdown menus are much more styled now. New! — The hell just got frozen as Pro Colors now offer icons! With this release you'll be able to pick one of the two icon themes fully hormonized and carefully aligned for this theme. They work great on both Light and Dark themes. New! — Go Lang is now officially onboard of the first class supported languages! New! — Hell got even more frozen because we now also support C++ first class! Many many goodies for C++ are included. New! — This version has a new light theme called "Eye Light" which is basically the same as original Kary Light with a darker background for when you feel the light theme is tooo light! Change! — Much better panel view coloring. Change! — Much much better CSS variable coloring. Change! — JS Docs are improved. Fix! — Many many brace problems in CSS are now addressed within this version. New! — Better XML tag support. Fix! — CSS punctuation are much better now. 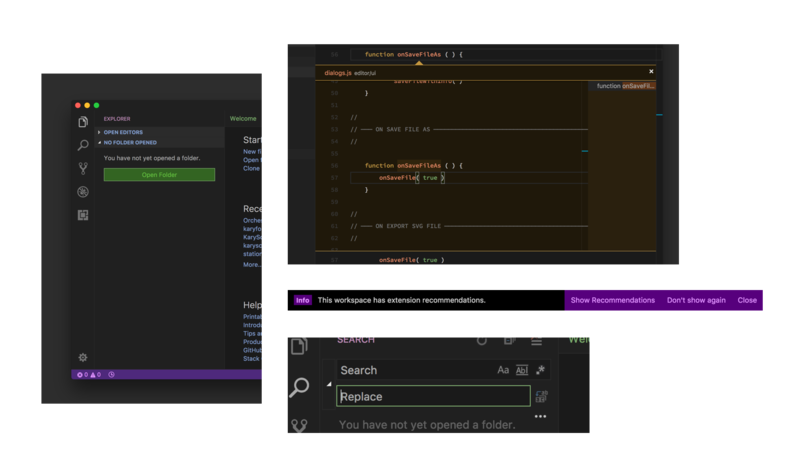 BIG CHANGES — Dark theme now contains many many many more workbench customizations. (we're getting near full workbench theme.). NOTE: It actually takes quite a bit to choose colors and decide what is a better design so we're sorry if it's a slow process. New! — Picker view is now fully themed to be pretty in your eyes! New! — Gutter colors are added. New! — Notifications are now beautified. New! — Button colors are beautified. Fix! — HTML DOCTYPE recently went on black. This is fixed now. New! — CSS @media properties are now very better looking. Fix! — We forgot to have a right peek view in the dark theme which we are very sorry for. That must have made all of you guys very upset. In hope that you'll forgive us there is now a very cool peek view in the dark themes and we hope you like it! New! — We'll be supporting haXe language from this version up. New! — This version includes a new theme called Minimal Dark which features the same preferences as the dark theme but only it has no orange / red on the dark! It's really an interesting new look for the dark. Fix! 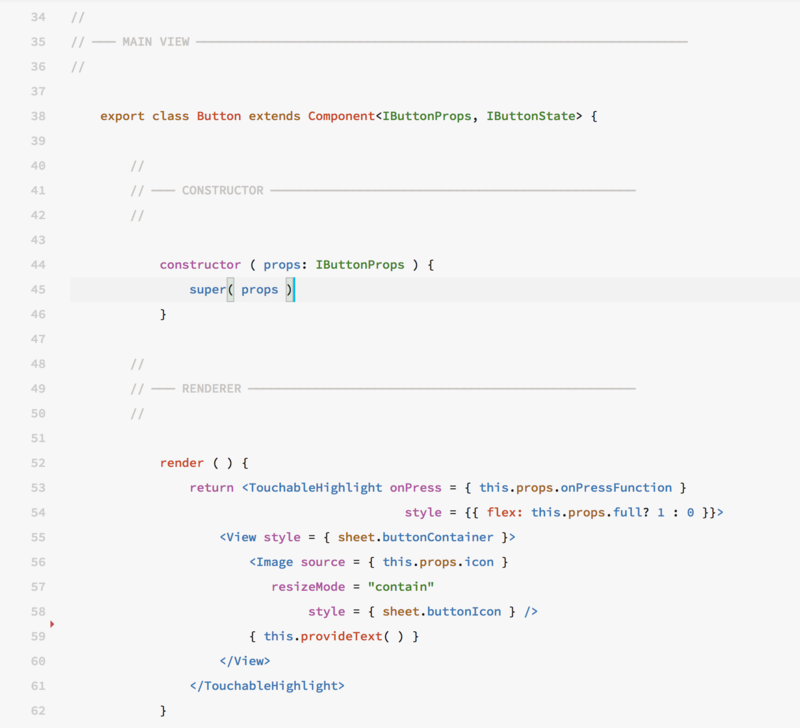 — Headers in Markdown had a strange bug that they rendered red color of the light theme in the dark theme. It's now fixed. New! 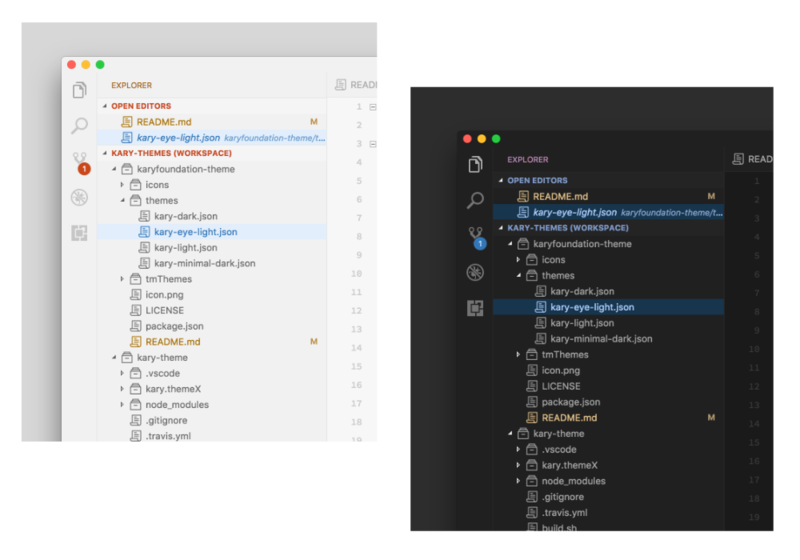 — Dark Theme now supports full workbench theme!!! New! — Light Theme now supports full workbench theme!!! Change! — New simpler name! Fix! — We had a report on PHP support (thanks to m-thorsen) and dear @coastermcgee fixed it. Change! — Better JS support, having constants and template strings in better shape. New! — A completely new Markdown experience based on the look of the pageman language is brought to you in this version. New! — JSX just got awesome in TypeScript React (TSX files). Supporting 20 new custom tokens. Fix! — Arrow Functions got much better in the recent version. New! — PEG.js Language tokens are added. New! — Great awesome support for JSX in JS and TSX files. Change! — CSS Property Values are improved. New! — HTML Entities are added. Change! — This color is changed. New! — TypeScript Enums are greatly supported now. New! — More hormonic class keyword colors for JS/TS. Change! — Better color for * in JS/TS imports. New! — HTML Entities added. Change! — CSS function colors are changed. New! — CSS constant property values are added. Change! — Better color for this. New! 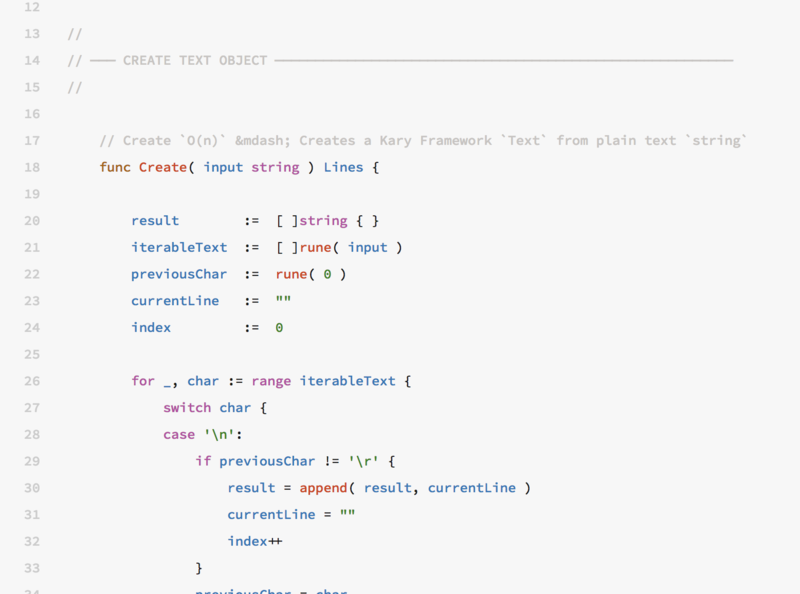 — Type Annotation < ... > added. New! — super got added. New! 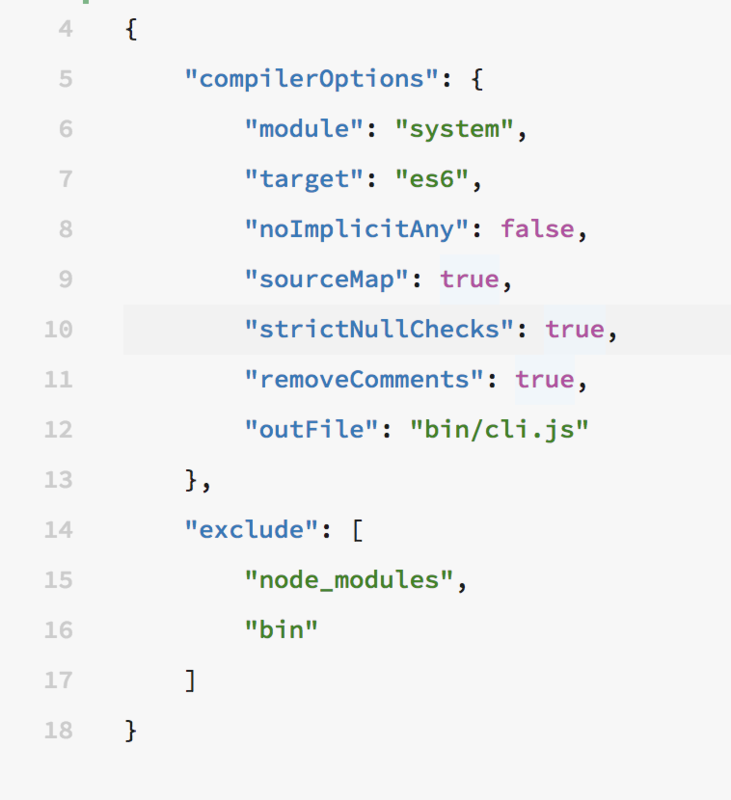 — Node.js module support added (JS/TS). Change! — Selection Colors changed. New! — JS Support Functions are added. Change! 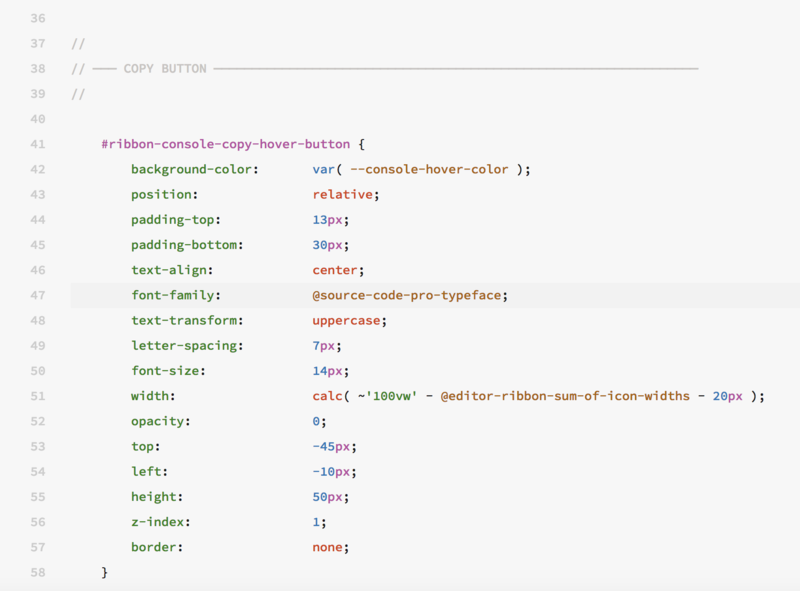 — JS DOM Colors are changed. Change! — Logical operators are now colorless. New! — JS Braces are improved. New! — HTML DOCTYPEs are added. New! 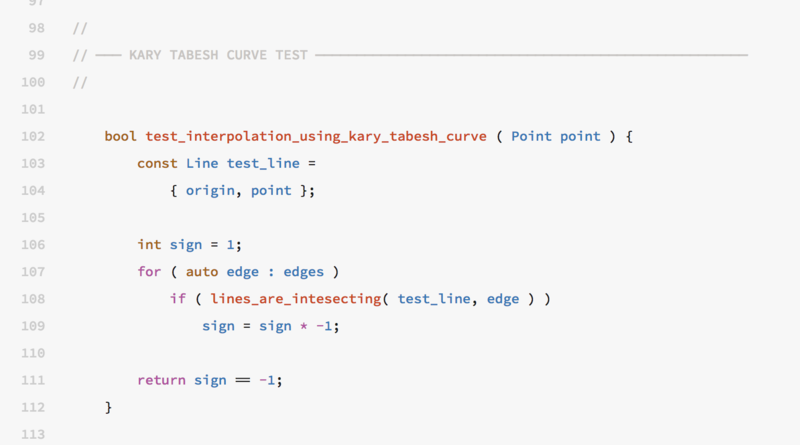 — In TypeScript deceleration types are added. Change! — Light Colors are fixed. New! — Pretty new icon for the theme! :D.
Change — The colors in the light theme has been polished a lot and you'll heave super much better experience using them. Change! — Dark colors are improved for good. New! — CSS / Less are now fully supported. We had great support but with the new definitions they didn't worked. This new version includes the new defs to provide the bust support. New! — We now have a fully support for Ruby including: Class Variables, Global Variables, Ruby Separators (do | ... |), def keyword, Right string interpolations. Fix! — Type colors had so many issues, they are fixed for good. New! — We now have full support fur Pageman (The whole definition is included). Fix! — Namespace color is fixed. Upcoming! — As you know with the new grammar of Visual Studio Code 1.7 we now have functions in everywhere colored as red. This is due to a limitation of the grammar. We have opend a pull request to address the problem and provide a solution. We're hoping to have it fixed in the next versions of visual studio code if possible. Change! — Strings are now blue again. Also string interpolation is added. Change! — Function export types are orange. Change! 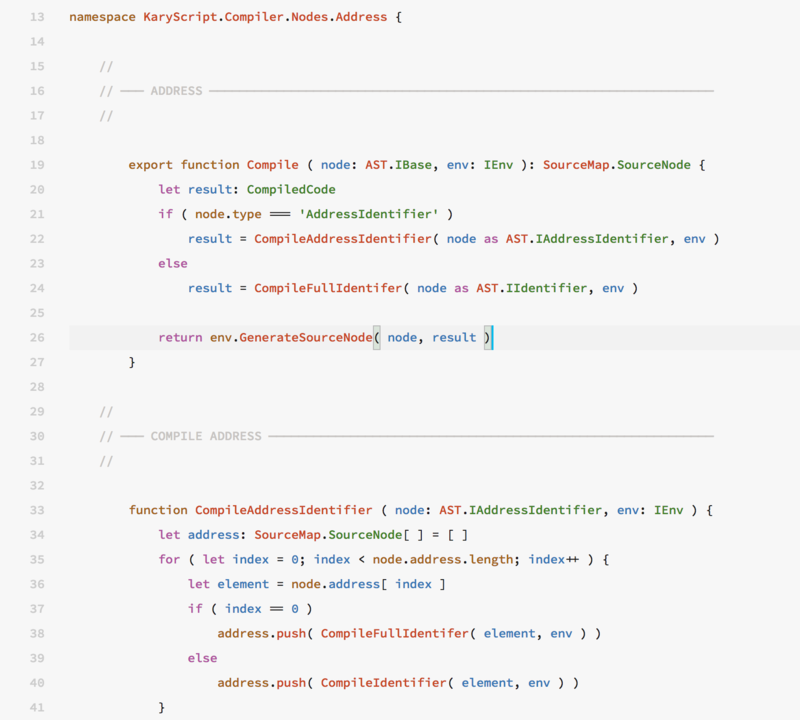 — Comparison and Relational operators are orange now. Change! — Special Keywords are being taken care of. Upcoming — Special Ruby Token will be added soon. Change! 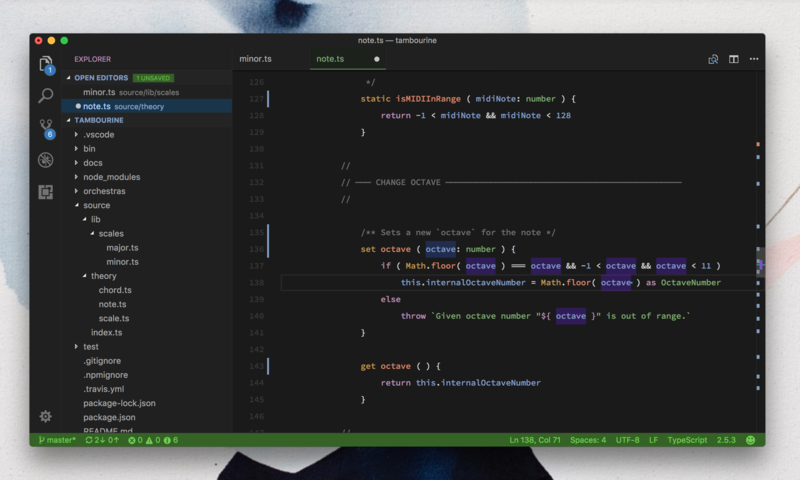 — The dark theme's background is lighted a bit to match the dark background of the vscode. This way it has more eye comfort. Issue #1 — Thanks to dear Murriouz a bug was reported about invalid code's rendering and it's not fixed. Upcoming — For the next release we'll be having Babel syntax support. Change! — The theme is now ported to themeX. As the themeX project itself is just started it may take weeks till we develop adaptors for other editors but once we reach there, using one code base we will compile the theme for all the other editors at ever single update. So soon we'll have support for other main big editors. Thanks for being with us till now. Change! — Operators are now blue! Change! — No line highlight for dark theme. New! — Versions are now synced across all versions. New! — Operator Keywords now render just like normal text. (better right?). Fix! — As it turns out Mac uses a Gamma 1.8 RGB but the standard for tmThemes are sRGB. Thanks to the great tool "tmTheme Color Convertor" the theme has being fixed and the colors no longer looks dark! New! 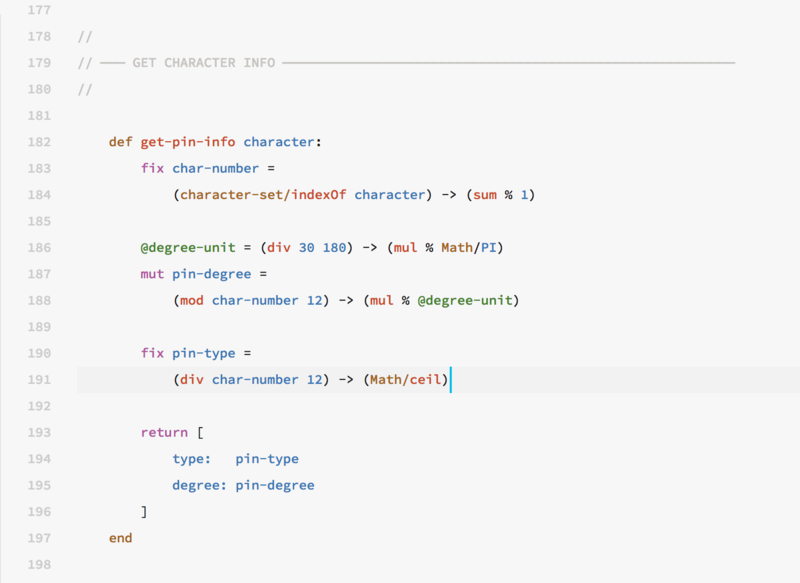 — TypeScript's Type Cast Expression now has custom coloring. New! — Custom string color for HTML added. Fix! — Markdown Heading color changed to be more hormonic.